Copy writing can get expensive if you don’t have your marketing purpose clear. The more time you invest in marketing clarity, the less time and money you’ll need to spend getting your copy and content fit for purpose. The 4 questions around people helped me think through clients, colleagues and collaborations. Cath’s questions on “What specifically?” focussed on aligning my skills with my customers’ needs. The “Where” questions speak to logistics and delivery effectiveness. The thorny “how much” question set helped me review my value proposition. The “how” questions on connection and communication reminded me business is about relationships, not just sales. Time management is a big issue – how to spend time strategically instead of always “doing”? Are you clear on your marketing? 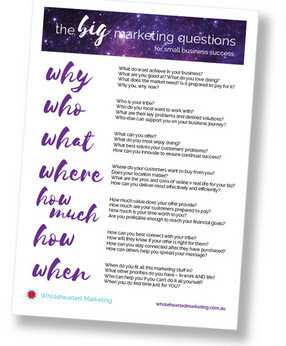 If it’s been a while since you stepped back from working “in your business”, time out with The Big Marketing Questions might be a good way to get a new perspective. Looking for smarter copy or content? Book a session with Leigh!